Prime Minister Hun Sen yesterday called on security forces to strengthen their loyalty to the current government, and warned that opposition members causing problems on the country’s disputed border with Vietnam would be clapped in irons, regardless of parliamentary immunity. 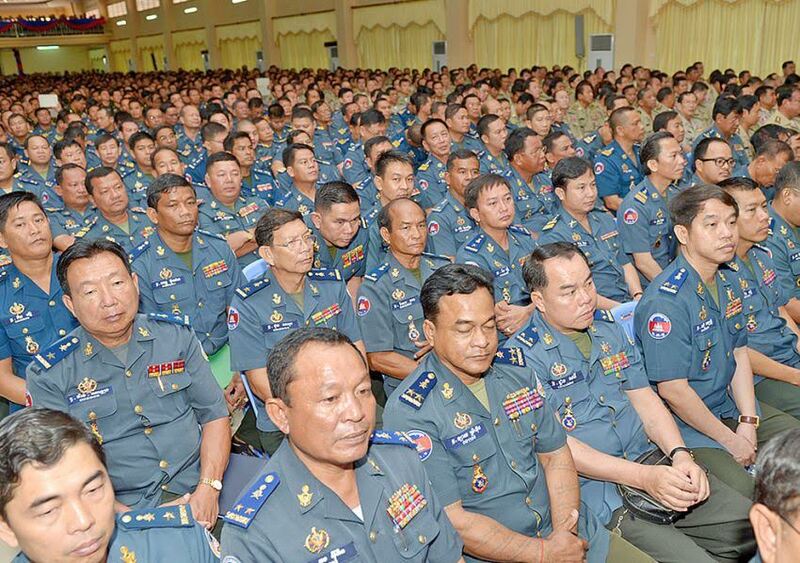 The remarks were made in a speech to some 5,000 senior military and police officials at the headquarters of the premier’s Bodyguard Unit in Kandal’s Takhmao town – often referred to as the “Tiger’s Den”. According to a member of the armed forces who attended yesterday’s speech, and who spoke on condition of anonymity, Hun Sen had also called on the armed forces to immediately take measures against any political group attempting to topple the “legitimate” regime. “The armed forces must be loyal to the government and have to prevent any act of colour revolution,” the source quoted Hun Sen as saying. In February, the ruling Cambodian People’s Party appointed nearly 100 senior military and police officials to its central committee, a move widely interpreted as a bid to cement loyalty among the armed forces. The speech included strong words for the opposition Cambodia National Rescue Party, just days after 11 of its members were handed lengthy jail terms for staging a so-called “insurrection” – sentences rights groups decried as an “absurd” miscarriage of justice. “In front of the senior armed forces, the premier said it was lucky that the rival group who had provoked issues at the border hadn’t caused any serious disaster,” said the source, referring to a recent border trip by opposition lawmakers with more than a thousand supporters in tow. The source went on to say that Hun Sen also took aim at CNRP president Sam Rainsy, who left for France on the same day his party’s members were sentenced. Hun Sen reportedly took issue with a border map Rainsy recently purchased in France, and said the opposition leader had not so much as mentioned it during the friendly dinner the two recently shared with their families. “Rainsy is not honest, and now he has left the country and left [CNRP deputy president] Kem Sokha to resolve the problem,” the source quoted the premier as saying. Rainsy did not respond directly to questions about the premier’s speech, but in a statement he defended his decision to travel abroad despite the convictions of his supporters. “I planned my trip to France many weeks ago,” he said in the statement. CNRP spokesman Yem Ponharith could not be reached for comment. Sok Eysan, a spokesman for Hun Sen’s ruling Cambodian People’s Party, said yesterday that the premier’s remarks had been a routine instructional speech about the responsibility of the armed forces and how to peacefully cooperate with Cambodia’s neighbours. “It was a normal meeting. 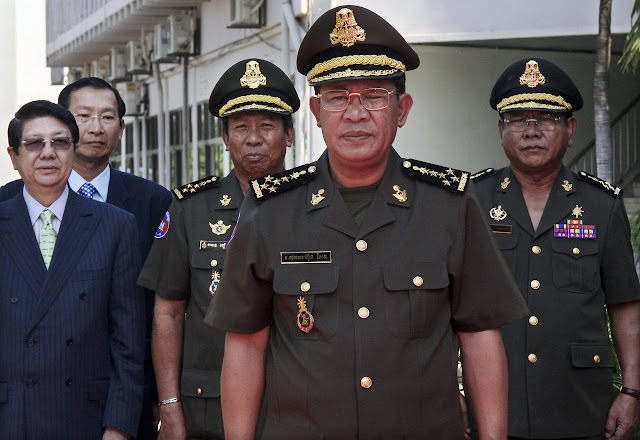 Samdech Techo Hun Sen just advised all types of armed forces to strengthen their obligation, [and] to be united to protect territorial sovereignty with neighbouring countries by peaceful means,” Eysan said. The devil government asked the loyal from the everybody while he and his gang never have a loyal for their own country and compatriots. It is very ridiculous. Indeed, when the leader has no loyal the followers have no loyal either. You should know about that. They are "YOUN" viets, not khmer. No wonder the police hits and shooting khmer people. The viets want to wipe out khmers. We, khmer have to stand up before too late. Please Khmer army or polices or securities interior ministry high ranking officers, you are all from Khmer blood, you swear to sacrifice your life for protection Khmer nation, integrity ,dignity and pride . Khmer need you to waking up, stand up in front of this terrorist government, who declared in broad day to destroy any Khmer dare to confront with enemy invasion .You have arm , armor or rocket launcher , tank and any weapon necessary tool in your hand, you need to turn away and to protect the country you belong to but not to protect one group traitor terrorist clan . Please wake up as a Kon Khmer blood to confront these enemy insider ,who unabated ceded land or commit crime to killed your own brothers,sisters, cousins or even your parents to please enemy Yuon scheme . To force you to stand up with your own blood stream is an insane fact . Please ignore this warning and contort with this brutal killer man .